Whether you do one-on-one training, lead small-group programs or teach full-scale fitness classes, chances are you're always looking for new ways to keep your clients and participants engaged and challenged. While there is no shortage of equipment options available, they aren't always affordable or accessible. But if you take a look around your health club or gym, you'll likely see that balls—stability balls, medicine balls, BOSU, sponge balls—are everywhere. They lend an element of playfulness to traditional exercises and offer new ways of working the body. And they've been proven to be very effective with a wide range of exercisers, from young to old, experienced to beginner. If you are stuck in a rut of grabbing the dumbbells or sticking with bodyweight exercises for every training session or group fitness class you lead, shake it up this year and play ball instead. 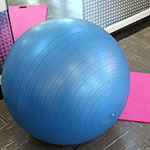 Stability balls have enjoyed long-standing success in the fields of rehabilitation and physical therapy. However, due to its effectiveness in developing balance and core strength, athletic trainers, coaches, personal trainers and physical education teachers began to integrate the stability ball into their programs. Today, you will be hard pressed to find a gym, instructor or trainer who doesn’t use this ball on a regular basis. Stability balls are extremely versatile and can take the most basic exercise and make it easier or more difficult. Take the push-up, for example. For a beginner, senior or a larger person, a push-up performed while lying across a ball can be easier than a floor push-up. The more bodyweight you have on top of the ball, the easier the push-up will be to perform. However, when the ball is positioned beneath the legs or the feet, the challenge becomes significantly greater, even for the advanced exerciser. Chest Fly With Balance: This exercise turns the ball into a weight bench. Grab a pair of dumbbells and position the head and shoulders on the ball. The rest of the body will be in a table-top position, with your core working to hold a bench-like position. Perform the chest fly while maintaining a straight line throughout the rest of the body. Using the ball instead of a bench works the core stabilizers and turns an otherwise basic exercise into a full-body challenge. To increase the intensity, use one heavy dumbbell and alternate the dumbbell while performing the fly. Because one hand is empty as it opens, the obliques and glutes are challenged to prevent the body from tipping over. 55cm = 5' to 5' 7"
65cm = 5' 8" to 6' 3"
75cm = over 6' 3"
The balls will lose size over time as the air escapes, so be sure to keep the balls inflated to their proper levels. Medicine balls offer a great alternative to dumbbells. First, they prepare the body for realistic motions. Because you are not fixed to a single plane of movement, you can add throwing, swinging and rotational movements whenever possible. This is a great way to strengthen the supporting muscles and tendons around key joints, which can be helpful in preventing typical injuries to the shoulder, elbow, knee and ankle. Medicine balls can also be used to perform explosive movements and increase power for all types of sports activities, including basketball and tennis. Medicine balls, which can be tossed or bounced, and can even float in the pool, can weigh up to 20 pounds. In a group fitness setting 2- to 8-pound balls are recommended. Unlike a dumbbell, a 2-pound increase in a medicine ball is significant, so cue your beginners to start light and increase the weight of the ball gradually over time. Dynamic Partner Push-up: This is a fun exercise to use with a group because it encourages participants to interact without invading each other’s personal space. Have partners position their mats end to end with about 4 to 5 feet in between. Each partner kneels at the back of his or her mat. One partner holds a medicine ball above the head and begins to fall forward toward his or her partner, slamming the ball to the floor while falling into a kneeling push-up. The other partner catches the ball and repeats. Be sure to cue participants to wait to throw the ball until they are certain their partner is ready. Forward Lunge With Medicine Ball Arc: Begin by holding the ball overhead while performing alternating forward lunges. Once participants feel balanced, instruct them to step forward with the right leg and lower the medicine ball with the left hand to the left side. Push back to the starting position and raise the ball overhead. Repeat with the other leg and continue alternating. Sponge balls were originally designed for mind/body classes and have become an excellent (and low-cost) tool for adding dimension to many traditional Pilates or yoga exercises. When used correctly, the sponge ball can enhance core muscle activation or help with technique for postural alignment. Sponge Ball Bridge: This exercise adds the dynamic of balance and increases the recruitment of core stabilizers. Starting in a supine position, bend the knees and place both feet in the center of the sponge ball. Keep the arms relaxed along the sides of the body and avoid using them as a crutch. Prepare for the exercise by tightening the transverse abdominis and inhaling. Exhale and lift the spine up in one straight line until only the shoulders and head are in contact with the floor. Inhale and hold the position, squeezing the abdominals, glutes and legs. Exhale and gently lower the body back toward the floor and hover about 2 inches above the ground. Remember to keep the hips steady and use your core muscles to keep from wobbling off the ball. Sponge Ball Bicycle: Starting in a supine position, place the sponge ball under the lower back around the sacrum area. Engage the transverse abdominis and bring the knees to a table-top position. With fingertips on either side of the head, reach the right leg away while twisting the torso and bringing the right shoulder toward your left knee. Alternate left and right very slowly, focusing on keeping the hips steady and aligned. Have participants imagine a full teacup that they don't want to spill balanced on their belly button, and remind them to avoid pulling on the head, and twist from the core of the body. Most sponge balls are about 8 inches in diameter and should be soft and squishy when being used. Considered by many to be an exercise staple, the BOSU offers a wide range of exercise options, for both group and one-one-on training settings. When the dome side faces up, the BOSU provides an unstable surface while the device itself remains stable. This combination of stable/unstable enables individuals of all fitness levels to experience benefits. When the BOSU is flipped, the device becomes highly unstable and is particularly effective for balance-challenging activities. Kneeling Spinal Balance: This exercise will challenge even the most seasoned athlete, and yet is appropriate for beginners as well. With the dome side up, kneel on the BOSU and position the hands on the floor in front. Lift the right leg and hold for a few moments. Increase the intensity by lifting the opposite arm. Cue participants to focus on contracting the core muscles while trying to maintain balance. Repeat on the other side. Squat-Lunge-Squat: With the dome side down, cue participants to stand on top of the platform and perform eight squats with the feet close together. Next, step the right foot off the back of the platform into a lunge and perform eight stationary lunges. Step back up on the platform for another eight squats and then repeat the stationary lunge with the left foot. Reduce the number of repetitions to four and repeat the entire series. Beginners may need help balancing atop the platform and can even skip the lunge portion of the exercise if necessary. If your studio or training area is packed, too many rolling items on the floor can be dangerous. Depending on the type of class you're teaching, instruct participants to grab two or three accessories at the beginning of class and pile them to the side of their step or mat or place around the rim of the room. (Note: If the medicine balls won’t sit still, place in a step riser to keep them still when not being used.) This way, it’s no problem to switch from a stability-ball lunge to a medicine ball squat. . .just be sure to cue what’s coming next and allow time to switch pieces of equipment. As always, a little pre-class planning is helpful. For example, in a total-body strength class, alternate lower- and upper-body exercises to keep the blood from pooling and to keep the class flowing without 30 seconds of rest between exercises. Plan a lower-body stability-ball exercise followed by an upper-body stability-ball exercise using dumbbells. Then cue a new piece of equipment and go back to the lower body. In other words, you don’t want to create a circus by changing equipment every 15 reps, but rather get creative and do two or three things in a row with one piece of equipment and then move to the next thing. This allows for enough variety to continually challenge your mind and muscles, but doesn’t create mass chaos. Soft mini weighted balls are often used to recruit more muscles while performing Pilates exercises, and they also are useful for adding a strength challenge to many yoga poses. The 4-inch balls, which range in weight from 1 to 8 pounds, fit nicely into the palms of your hands, but feel like a heavy beanbag. Warrior With the Balls: Holding a ball in each hand, assume a lunge position with the front leg at a right angle and the back foot turned slightly in; the ankles should be in one line. Turn the torso toward the front leg and reach both arms up into warrior I pose. Hold for a few breaths and continue to warrior II by reaching arms forward and back and even with the shoulders. Hold the balls, palms up, and cue participants to keep their shoulder blades down and back. Continue to move through reverse warrior and triangle while holding the balls. If the shoulders and arms become fatigued, place the balls on the ground. Forearm Sideplank With Shoulder Raise: Begin on the floor on one side, legs straight and stacked on top of one another, and the forearm on the floor with the elbow directly beneath the shoulder. Hold a ball in the top hand and extend the arm to the front while raising the torso into side plank. Slowly lift the ball toward the ceiling while maintaining the side-plank position. Lower the ball and repeat. To reduce the intensity, bend the lower knee and place it on the ground for increased stability. Chris Freytag is a health and fitness expert, blogger, author and motivational speaker and is an ACE-certified GFI, PT and Health Coach. She is the contributing fitness editor for Prevention Magazine; the fitness contributor for the NBC affiliate in Minneapolis: and Chairman of the Board of Directors for the American Council on Exercise. She also has authored 5 books and dozens of fitness DVD's including the new ACE HIIT series. Connect with Chris at www.chrisfreytag.com. Need to breathe new life into your small-group training or group fitness classes? Look no further than ACE West on May 16–18 in San Diego. Our three-day event will feature sessions from some of the brightest group fitness minds in the industry including Shannon Fable, Dan McDonogh, Ken Weichert and more. Our two-DVD series of high-intensity interval-training workouts with fitness expert Chris Freytag is now available in a video-streaming option. Now you can build muscle and strength with HIIT using your favorite mobile device. Don’t miss out on your chance to learn for FREE with our upcoming ACE webinar, The Coach’s Toolkit, by ACE Senior Consultant Dr. Michael Mantell. Join us from the comfort of your home as Dr. Mantell discusses behavior-based tools you can use with your clients. If you choose, you can pay for the continuing education quiz later on.